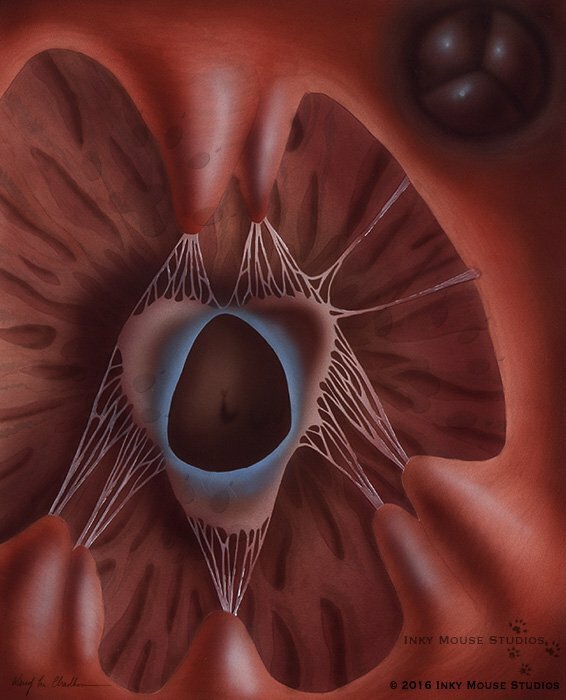 Landscape illustration of the inside of the right ventricle of the human heart. On this subzero Valentines Day I find myself reminiscing, not of flowers and chocolates, but of finding and fostering the passion for one’s life, and the things you want to do with it. There are things in life that simply are what they are – much like this illustration of the human heart that I pulled out of my archive. To you, it is just an illustration of a heart. To me, it is a time in my life that I was learning new things, meeting new people, and finding something that I thoroughly enjoyed losing myself (and finding myself) in. Look at it from one way, and you see the anatomical point of view, the nuts and bolts of the anatomy of the human heart. For those of you who want a quick anatomy lesson, this is the view from the bottom of the right ventricle of the heart. From this vantage point, you are looking up at the opening of the tricuspid valve, which separates the right ventricle from the right atrium when the heart contracts. Off in the right upper corner is the closed pulmonary valve, beyond which is the pulmonary trunk and the pathway to the lungs. There are various papillary muscles, and the delicate chordae tendineae, which help hold the flaps of the tricuspid valve in place as the heart contracts and the valve snaps closed preventing the backflow of blood into the atrium. Look at it from another way, the frenzied energetic way in which the human heart actually exists, since it is always in motion as long as you are alive. Imagine the rush of blood as it passes from one chamber to the next, passing through one valve and then another, on its way to somewhere else in a ceaseless (hopefully) journey through the human body. Now that you have an understanding of what it is you are looking at, now take it a little deeper, and figure out your own perspective on it. Simply understanding what it is, and how it works isn’t enough, now you need to apply it. This is the challenge as a medical illustrator, to take the known, the factual, and understand it, then to turn around, apply your own perspective to it, and teach it to someone else, without simply dictating or copying what has come before. But in actuality, it can be applied to just about everyone. This is where the passion comes in, this is where the creativity lies, this is what so many people need to get back in touch with in their everyday lives. This little spark of creativity can create ripples that touch and impact so many other aspects of your life that it may boggle your mind initially. It is also what sets you apart, what gives you your voice, and what ultimately will ignite a passion for doing exactly what it is you’re were meant to do, and once you have found that, do whatever you have to in order to not lose sight of it, for it is a precious thing. Go forth and find your passion, find your perspective, find yourself, do what you love and love what you do, and in the end, you will have lived a good life.